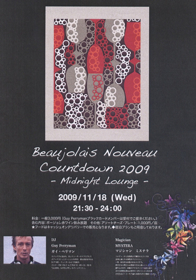 Join me at Beaujolais Nouveau Countdown 2009 – Midnight Lounge to celebrate this season’s fine French wine at the Park Hotel, Shiodome Tokyo on Wednesday 2009.11.18 9:30pm-12:30am. I’ll be spinning some luxurious lounge tunes in this luxurious lobby lounge on the 25th floor, there’ll be table magic with magician Mystera & at midnight we countdown to the launch in Japan of this year’s Beaujolais Nouveau with a complimentary kampai!! 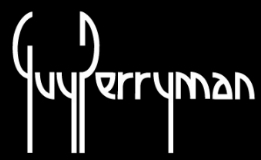 Guy Perryman Black Card Members Â¥2,000. This entry was posted on Monday, November 2nd, 2009 at 11:34 am and is filed under Tokyo Direct. You can follow any responses to this entry through the RSS 2.0 feed. You can leave a response, or trackback from your own site.